It’s a beautiful day in Manhattan as excited tourists board the floating Air and Space Museum on the USS Intrepid—until a horrible explosion rips across the flight deck, showering the body parts of innocent people everywhere. The perpetrator is none other than Captain Ahmed Salehi, an Iranian mastermind whose last terrorism plot was foiled at the last minute by Op-Center. Back in Washington, the White House orders Op-Center disbanded—or so it seems. 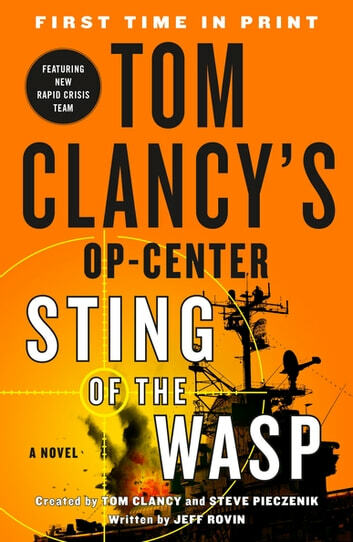 Unbeknownst to America’s enemies, director Chase Williams has been put in charge of a brand-new, top-secret covert attack team known only as BLACK WASP. Its members, each chosen for their unique set of specialized black-ops skills—martial arts expert Lieutenant Grace Lee, sharpshooter Lance Corporal Jaz Rivette, and JAG attorney and criminologist Major Hamilton Breen—have been assigned to seek out Salehi and finally bring him to justice. But Salehi is part of an even more frightening conspiracy, led by a renegade Iranian tycoon determined to establish a new Islamic State that will dwarf the horrors of ISIS. From the heart of Manhattan, to the swamps of Trinidad, to the sunbaked mud villages of Yemen, this new Op-Center is America’s only line of defense against a bloody Middle Eastern tyrant.